Four years ago when Rolland-Warner Middle School opened, Burns & Doris Rolland (one half of the namesake of the school) started an endowment to help defray the costs of extra opportunities for students to experience arts and culture outside of their school day. Since then, the money has continued to grow. This year, the Rollands said they would match any funds that were raised for the endowment in 2014. 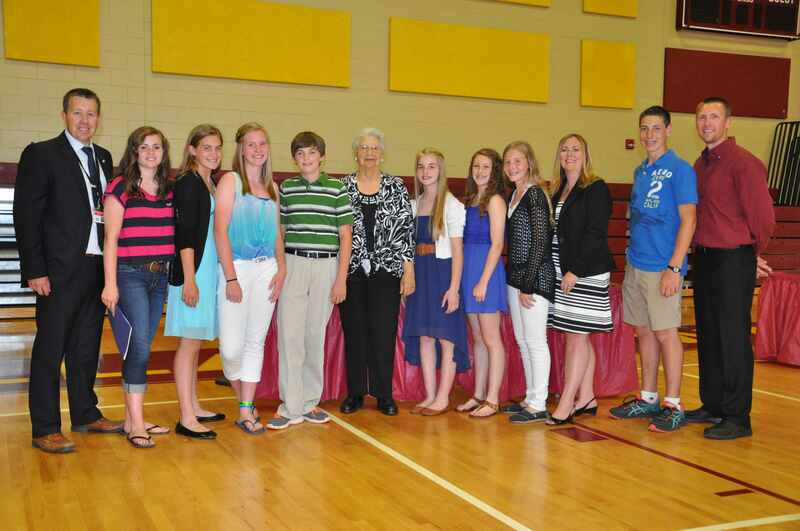 Yesterday, at the 8th grade awards ceremony, staff and students had a chance to give back. The Rolland-Warner staff raised money by donating $5 to wear jeans and dress in Rolland-Warner spirit gear several times this year. They donated $300 to the endowment. The Rolland-Warner student council raised $500 over the course of the school year to be able to give to this fund as well. Mrs. Rolland was able to attend the ceremony and students and staff presented her with the two checks on Thursday, June 12.